For the true ‘giants’ in the history of Karate it does. But what about now…? The founding fathers and their first students, the pioneers of modern Karate are all long gone. The passage of time has only added to their legend - and rightly so. They had the foresight and determination to take obscure fighting drills from the back yards of Okinawa to the world. ...their place in martial arts history is safe. Karate technique always had the potential to capture the world’s imagination. But it was never going to happen without the efforts of a few special men. The traditional Karate master was not necessarily a master in the technical sense his genius lay in how he analyzed, adapted and recorded what he knew. Whether he was aware of it or not, this ‘packaging’ of knowledge was the birth of Karate styles. …it was also a way of preparing to spread Karate - not just from generation to generation but across all cultural and international boundaries. That done, the reigns were handed over and the art leapt forward. 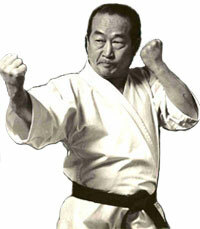 The term Karate master became embedded in martial arts history. The best example of this was Gichin Funakoshi (below and above center) an Okinawan schoolteacher who stepped up to shape the history of Karate. The name Gichin Funakoshi means something to all traditional Karate-ka. He is acknowledged as the major figure in the development of an art that has taken its place in the Budo tradition of Japan and the world over. "Karate-Do My Way of Life"
So, Karate-do which, in my childhood, was a clandestine local Okinawan activity, had finally become one of Japan’s Martial Arts before it took wings and flew to America. Now it is known all over the world. Japanese Karate is now popular everywhere - thanks to the efforts of the old masters. Major Karate styles are established worldwide and all types of Karate both ‘sport’ and ‘budo’ have hundreds of millions of followers. The modern Karate master is a different breed. ...less of a pioneer but technically superior. Take a look at footage of Karate katas from the early last century - you will recognize the moves – it is unmistakably Karate technique waza - but they are rigid and lack dynamism. They’re old and quaint to look at. We’ve come a very long way. Contrast the ability of today’s high class Karateka and you will see its streets ahead. Even the basic Karate technique of today’s average Karate black belt is better. ...that’s what the old masters wanted. Every generation should slice years off the learning curve, make quantum improvement and learn faster than the last. 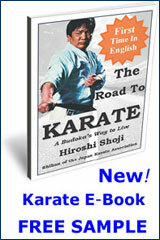 There are Karateka alive today from all types of Karate who have developed and refined Karate technique to a level never seen before. They have broken the mold. They are motivated by excellence. They’re on a mission to pass on their brand of Karate for all the right reasons. Others (you can hear them a mile off) have gotten fat off the power that comes with the title. These guys are not Karateka they just happen to be ‘selling’ Karate technique ...but that’s another story. The future of Japanese Karate is in good hands..
..not just in Japan, the world over. There are plenty of men and women more than able to fill the shoes of those who came before them. They have the technical skills and values for the job. They have refined what they learned, and they are passing it on straight and true. Karate works. It delivers most of what it promises but it must keep looking outward as well as in. It must learn from all the other combat arts or it will become irrelevant. Who knows what Karate will look like in 50 years from now? 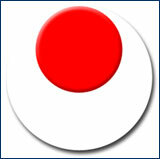 Maybe the sports Karate guys will succeed in getting Olympic recognition, maybe there will be a shift ‘back to budo’. Whatever happens, the ideals that inspired the early masters of Karate are still alive. It’s up to the instructors of today to keep it that way.